On July 15, 1982 an earthen dam built on Lawn Lake for irrigation purposes failed. The U.S. Geological Survey website has before and after topographical maps, as well as aerial photos of the area. There is a short trail to a bridge over the Roaring River and an excellent close-up look at the debris that was left behind. 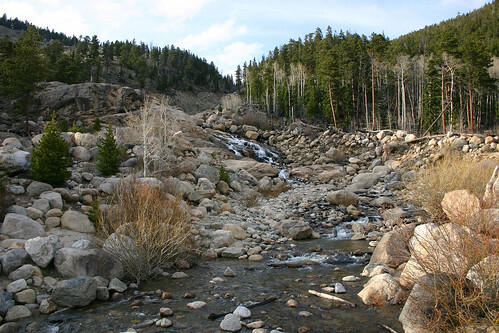 The resulting flood waters deposited this debris, known as an alluvial fan, in Horseshoe Park at the mouth of the Roaring River. The debris also dammed up the Fall River creating a new lake in Horseshoe Park. In addition, the flood waters caused Cascade Dam father down Fall River to fail and flooded the town of Estes Park. This entry was posted on May 9, 2008 at 11:46 pm and filed under alluvial fan, Colorado, Estes Park, Horseshoe Park, National Park, Roaring River, Rocky Mountain, Rocky Mountain National Park, vacation.